Oriflame is one of the worlds fastest growing cosmetics companies. 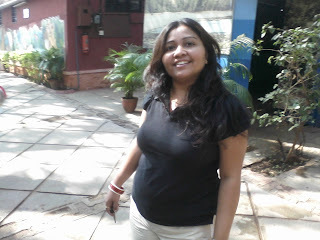 Anyone can join Oriflame cosmetics in Mumbai, India. All Oriflame's products are natural and never tested on animals. Many people are looking to buy Oriflame cosmetics and skin care products in Mumbai. If you join as an Oriflame consultant in Mumbai you can benefit by taking advantage of the demand for Oriflame products in Mumbai. We provide skin care product only after proper analysis of your skin, by skin tests / specialist analysis /and also computerized skin tests. 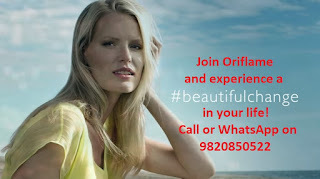 Oriflame cosmetics are only available from Oriflame consultants in Mumbai. There are no shops or outlets of Oriflame in Mumbai. To order Oriflame products you can call or WhatsApp Jashmi on 9820850522. For joining Oriflame WRITE TO ME at jashmiw@gmail.com or whatsapp me on 9820850522 or click on this link and fill this form. Mrs Jashmi is an Oriflame Gold Director from Mumbai, India.